You can contact us by email, phone or mail. ORDERING: If you would like to order one or more items please email us at info@nevadagem.com with the item numbers. A paypal invoice will be emailed to you directly. Payment Methods: PayPal, Money Order, Cashiers Check or Personal Check. We accept only US personal checks. Personal checks will be held until cleared. Buyer should e-mail us to confirm the form of payment they choose to use. Shipping and handling charges may vary depending upon the amount of items purchased. We require that buyer pays for insurance on all items purchased. Insurance cost will vary. Shipping & Handling: Buyer pays shipping and insurance. Sales Tax: 8.25% if shipped to California. Customer Service & Return Policy: Almost all items are professionally or digitally photographed. In a few instances scanning is used. Remember monitors may vary. 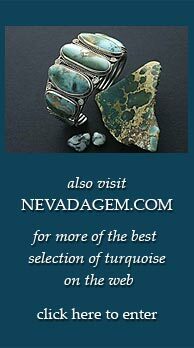 Every effort is made to describe our turquoise correctly. All items are guaranteed and any item not as represented can be returned within 10 days of receipt in original condition (excluding shipping). Please email us with any questions that you might have before buying. We look forward doing business with you!